3G: Put a +1/+1 counter on target creature. 2U, Remove a +1/+1 counter from a creature you control: Draw a card. Cool deck idea. Shapers of Nature is a bit too slow imo. 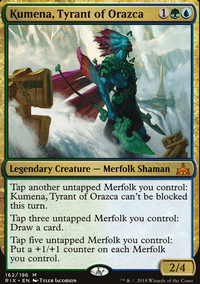 You could consider Seafloor Oracle for card draw instead, since a lot of your merfolk have evasion anyway. And you already have enough other creatures that distribute counters. Murphy77 thanks for the comment! Previous versions of the deck ran Simic Ascendancy , but I found it a bit lackluster. 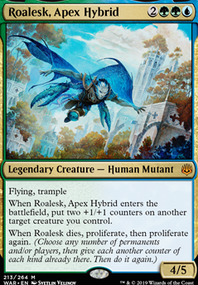 Shapers of Nature and hopefully Merfolk Skydiver can do the same thing, but better. 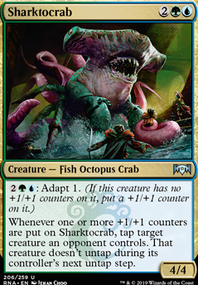 I am extremely hesitant to include Growth-Chamber Guardian , as the decks purpose is to get out sharktocrab and tap creatures, not support mid-range aggro. But I appreciate the feedback! Here is my advice. Every time I actually tried to run Shapers of Nature in a competitive group for the past year it was garbage. I would take them out and since you have ample of mana and need a mana sink I would add Simic Ascendancy . Yes you don't get the draw, but you put counters for cheaper and you get alternate win con. Cheers! Hey Brainpolice2, good recommendations. Knight of Autumn seems to be the MVP in the last FNM I went to. Removes enchantment based removals and slows down nexus decks makes it a must have for the deck in either main or sideboard. Negate has its moments but feels like more of a dead card as it just sat in my hand a few of the games I played. I like the idea of Assure / Assemble as part of the protection package for the first half and the second half to build your board post wipe or if you're that far ahead. 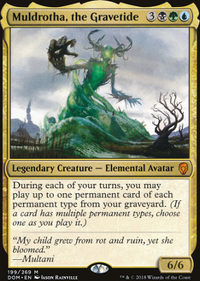 I'm also heavily considering Shapers of Nature for its utility and draw power in control and nexus matchups. Having the extra card advantage to pump out more creatures is huge against them. While I like Pteramander , it feels clunky in this deck. Decks that utilize larger amounts of non-creature spells push it well, but in this deck it's simply a 1/1 flier that you'll never really have the mana to adapt due to its aggressive nature in playing spells and pumping large amounts of mana into your X cost spells. Benthic Biomancer from my experience is a very hit or miss card overall. When you have dead cards in hand, it has huge potential. Later in the game though it loses its luster and becomes a small creature with mill yourself one when you put a counter on it. Appreciate the feedback and hope this helps! First, the most radical idea: Have you considered splashing just enough red to add Rhythm of the Wild ? 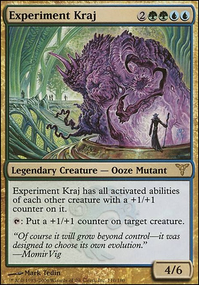 It can add a lot of counters to your pool and really increases the efficacy of the Incubation Druid and the Growth-Chamber Guardian , plus if in play none of you creatures can be countered, which can really screw over a lot of the control decks out there. If you do splash red, you could also add Expansion / Explosion which can pair nicely with the Wilderness Reclamation . 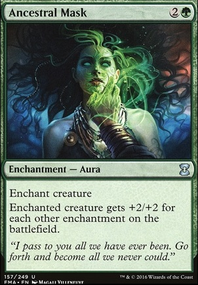 An even better card for your deck, in my opinion, would be Electrodominance . For a seven cost Electrodominance (which you can do easily with Wilderness Reclamation and your druids) , you can sneak in your Galloping Lizrog , casting it at the end of you opponent's turn. Then it is your turn with a Simic Ascendency with 20 counters and you win. Splashing the red could be pretty pricey if you don't have the cards for the mana base already, but if you have the cards...? 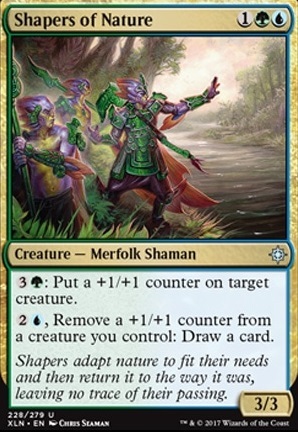 Finally, a card you might want to take a serious take a look at is Shapers of Nature . Combined with a Biomancer's Familiar , you are creating +1/+1 counters for 2 mana and drawing cards for 1 and it doesn't tap to do it. This means any extra mana from the Wilderness Reclamation can be put to great use. Id drop Shapers of Nature , Tishana, Voice of Thunder , Vivien of the Arkbow . simply put they take to much mana to run in this deck. Also you could put in cards like Harmonize , Opt for card draw and Solidarity of Heroes for buffing (this might be a bit to mana expensive tho) also there are cards like Vitalize and Benefactor's Draught would help this deck type.